Former Beatles drummer to perform in Tel Aviv on June 23. 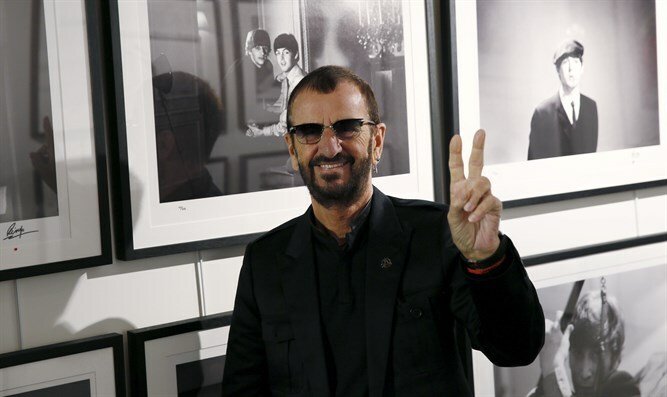 Former Beatles drummer Ringo Starr will perform in Israel this June as part of his European "Give More Love" tour, Haaretz reported Tuesday. The 77-year-old Starr will perform in Tel Aviv's Menora Mivtachim Arena on June 23 together with his "All Starr" band. Ticket prices start at 250 shekels ($72) and peak at 1,294 shekels ($374) for Golden Ring seats, according to the report. In 2008, Starr’s former bandmate Paul McCartney performed to over 40,000 Israelis. McCartney revealed that before the concert, he was actually threatened with his life by anti-Israel groups. “I got death threats, but I'm coming anyway. I got explicit death threats, but I have no intention of surrendering. I refuse to cancel my performances in Israel,” he said at the time. While death threats against artists performing in Israel may not be a common occurrence, foreign artists are nevertheless under immense pressure by supporters of the Boycott, Divestment and Sanctions (BDS) movement to cancel their shows in Israel. Just last week, New Zealand pop star Lorde cancelled a summer concert in Israel, after pro-Palestinian Arab fans in her native New Zealand criticized her. Much of the pressure on artists comes from former Pink Floyd frontman and notorious anti-Israel activist Roger Waters. While some artists have caved to the pressure and cancelled their Israel concerts, many have resisted the boycott calls. Australian rocker Nick Cave resisted boycott calls and went ahead with his Israel show and even criticized the BDS movement.